One of the reasons barbecue is exciting and fun is due to the various regional styles one can incorporate when grilling or smoking meats. Depending on where one resides, the idea of the perfect barbecued piece of meat can differ wildly. From Texas barbecue with its emphasis on rubs to tangy, saucy Kansas City barbecue, there’s a style for everyone to enjoy. So if you are looking to try out some Memphis-style ribs or North Carolina pulled pork, you’ll need a top-notch grill to help you out. 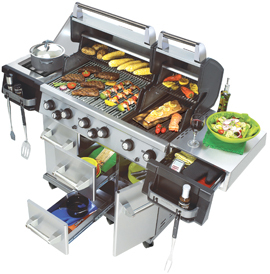 The Broil King Imperial XL from Onward Manufacturing comes with over 1,000 square inches of total cooking space with stainless-steel dual-tube burners, and solid stainless-steel cooking grids. The Broil King Imperial XL provides superior heat control and tremendous cooking versatility in two independent ovens, along with full extension drawers and cabinet doors optional storage space. R.H. Peterson recently introduced the new Fire Magic Smoker. 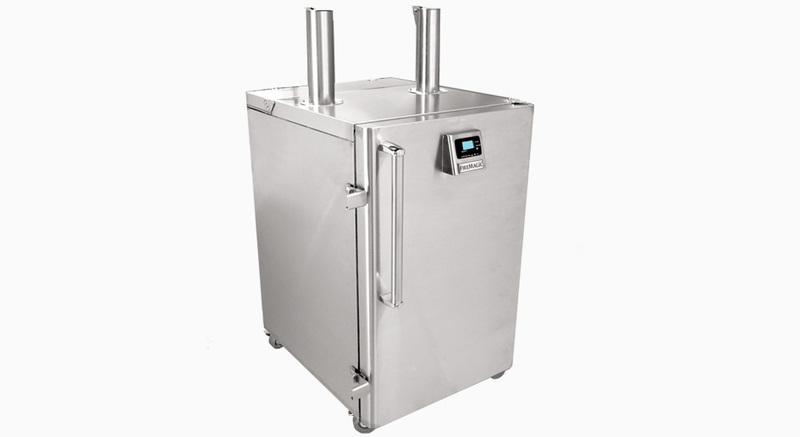 This commercial quality, stainless steel, high capacity Smoker perfectly smokes meats and vegetables using charcoal or wood chunks. A digital thermometer monitors the Smoker temperature, while an attached meat probe tracks food temperature. Multiple air and smoke vents allow precise temperature levels from start to finish.